Marc Lamont Hill, advocate for international justice, was accused by Jewish groups of anti-Semetic remarks. 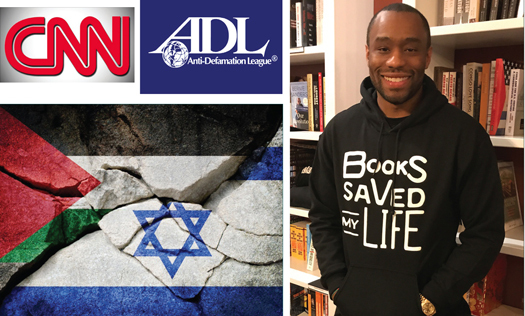 PHILADELPHIA—After remarks calling for justice for Palestinians and justice in Israel, Marc Lamont Hill, a noted academic, award-winning author and news analyst was attacked by Jewish groups, who forced his ouster from CNN. The 39-year-old advocate for international justice, who happens to own a bookstore in the city, responded by saying his remarks were not anti-Semitic but came out of his desire to speak truth—not to injure anyone. Despite his reasoned argument and willingness to engage with critics, the Jewish interpretation of his words not only cost the Philadelphia native his CNN position but also led to a push at Temple University to force him out of his position as a tenured professor. In an op-ed published Dec. 1 in the Philadelphia Inquirer, Mr. Hill says he meant no malice towards Jews or the state of Israel. “First, I strongly believe that we must reject anti-Semitism in any form or fashion. This means not only preventing physical violence against Jews, but also ugly anti-Semitic images, stereotypes, conspiracy theories, and mythologies,” he wrote. Jewish groups, including the ADL and others, pounced quickly. They denounced him as an anti-Semite, declaring his words echoed calls for destruction of the state of Israel issued by some Palestinian groups. Next came his firing from CNN and a Temple University board member and Jewish groups said he should be dismissed from the school. According to Electronic Intifada, a pro-Palestinian group, the words spoken by the professor point to simple recognition of reality: Historical Palestine, what is today Israel, the occupied West Bank, and Gaza Strip, is not free between the Jordan River and the Mediterranean Sea. The ADL and other blind supporters of Israel were apparently looking for the right opportunity to attack Mr. Hill and misinterpreted and blew his words up out of proportion. But even some Jewish groups and writers joined the chorus in defense of Mr. Hill. “Israel and the Jewish establishment keep on accusing the media, including CNN, of being slanderers of Israel. There’s no worse joke than that. Try to publish a critical article about Israel in a mainstream newspaper in the West—it’s getting more and more difficult, more often than not, impossible,” continued Mr. Levy. Mr. Levy added, “It turns out that the Jews are not as hated as Israel would like: Only 10 percent said they had any negative feelings about them. Nearly four times as many people said they don’t like Muslims. Along with its worrisome aspects, the survey points up more than a few truths you can’t deny. Twenty-eight percent of those questioned said that anti-Semitism in their countries is a result of Israeli policy. A third believe that Israel takes advantage of the Holocaust to advance its positions. One in five thought the Jews have too much influence in the media. “Fire more analysts who dare to criticize Israel or suggest just solutions to the occupation—and more people surveyed will say what everyone knows: The Jews and Israel have an incredible degree of influence in Western media. Now you can call me an anti-Semite, as well,” he concluded. Social critic, author, and intellectual Cornel West said, “The important thing is that we’ve got to stand with our dear brother Marc.” “All he is saying is that a Palestinian baby has the same value as a Jewish baby,” Mr. West told therealnews.com. Congresswoman-elect Rashida Talib (D-Mich.), one of the first two Muslim American women elected to Congress, urged support for Mr. Hill. “Calling out the oppressive policies in Israel, advocating for Palestinians to be respected, and for Israelis and Palestinians alike to have peace and freedom is not anti-Semitic. @CNN, we all have a right to speak up about injustice any and everywhere,” she tweeted.